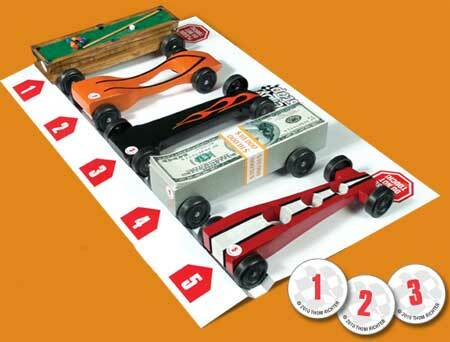 This staging platform will keep your Pinewood Derby cars organized. It's as easy as ABC! 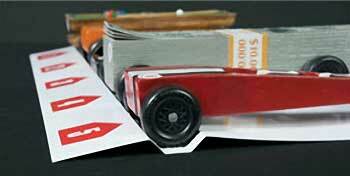 or Awana Grand Prix cars on race day. Very easy to assemble. 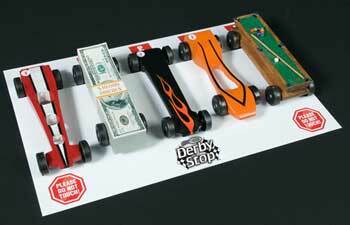 Constructed from heavy-weight paper, Derby Stop sheets are designed with a special channel to keep cars from rolling away. Each sheet holds five standard-width cars in clearly numbered spaces. the pinewood cars while on display. Coordinating numbered car stickers help race organizers check in and identify each racer’s car before placing it on the Derby Stop sheet. 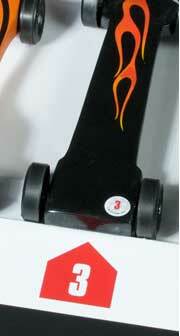 Derby Stop is available in sets that hold 30, 60 or 90 pinewood cars - Each car has its own unique slot and number.